Strong indirect evidence suggests that David Wood’s wife Jane was in fact Jane Currey and she was the daughter of Ezekiel Currey and Elizabeth Brownlee, but no documented proof has been found to date. A number of us have been researching this for quite a few years. I personally have pursued this challenge for the past 15 years. For many years I had suspected there was a connection of Jane to the Currey family since she named one of their sons Robert Brownle (as spelled in the family bible). Then when I really began digging into David and Jane’s children, I found many grandchildren with middle names of Currie and Curry. I also saw a pattern of children named John, Ezekiel, Sibbel, and Elizabeth in several generations. This background encouraged me to begin looking for a female mtDNA lineage from Jane on down. I thought it best to begin with Jane’s side to find this all-female line because the possibilities of success were slim since there were only five girls out of their 14 children. So if I found someone on this side I was more confident in finding someone from Elizabeth Brownlee through one of her other daughters (8 girls out of 13 children). So I approached the toughest lineage first. In previous years I had been searching for evidence to show Susan Hendrix was the daughter of Thomas Hendrix and Henrietta Wood (a proven daughter of David and Jane per family Bible records) but only found circumstantial evidence. Recently I came across a tree on Ancestry.com that started with Susan Hendrix and Edwin Turner (but no further back) down to Virginia Stephenson (Way). The tree’s owner is Michael Kenning. 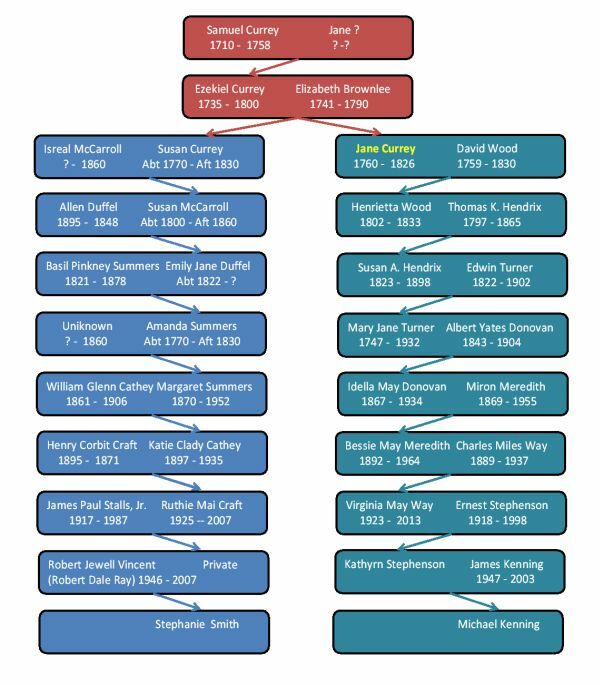 What is so interesting about this particular family tree (Stephenson Family Tree) is that it shows an all-female lineage, starting with Michael’s grandmother (Virginia), back to Susan Hendrix, AND potentially to David’s wife Jane if Susan was truly David and Jane’s daughter. Then another critical piece to this puzzle came to light when I saw an obituary on Find A Grave for Virginia Stephenson that also mentioned a Kathryn Kenning as a daughter. Here is the text from the memorial for Virginia May Way Stephenson on the website. Virginia Stephenson, 90, of Vidor, Texas, died Friday, October 11, 2013 at her residence. Born in Kansas City, MO, she was converted to the The Church of Jesus Christ of Latter-day Saints while living in Ponca City, OK. In 1974 she moved to Vidor, Texas. 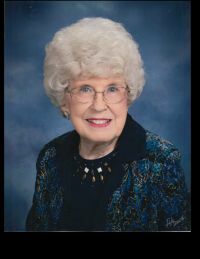 As a member of her church she held callings in Primary and the Relief Society but her passion was serving as The Librarian. Virginia worked in the Emergency room of St. Elizabeth's hospital many years. Funeral services will be held at 2:00 pm Tuesday, October 15, 2013 at the Church of Jesus Christ of Latter-Day Saints in Vidor, with burial to follow at Williamson Cemetery in Vidor. Virginia was preceded in death by her first husband Robert Wayne Dowker of Kansas City, MO and her second husband Ernest Baker Stephenson of Vidor, TX. She is survived by her son Keith Stephenson; daughters Sharon Ward, Kathryn Kenning and Sandra Leung; brother Robert Lee Way; 21 grandchildren, 43 great grandchildren and 1 great-great grandchild. The Kenning name is a bit unusual so I decided to follow-up with Michael to see if he knew Kathryn Kenning. After contacting Michael he confirmed his mother is indeed Kathryn Kenning (Stephenson). Michael’s family tree is on Ancestry.com (Stephenson Family Tree). So now the pieces were coming together and I had the potential to use mtDNA to genetically verify that Jane was a Currey and the daughter of Ezekiel and Elizabeth, IF I could find another similar all female line through one of the other daughters of Ezekiel and Elizabeth. They had 13 children and 8 of them were girls. So the odds looked good to find another female link back to Ezekiel and Elizabeth. During this process Stephanie Smith contacted me after someone had given her my name. This was in October 2011. She gave me her line and there it was; all females down from Elizabeth. Her family tree is on Ancestry.com (Smith, Stalls, Vincent Tree). So I wrote back to Stephanie asking if she would be willing to do the mtDNA test. She replied that she had already done that test. I couldn’t believe how that luck had fallen into my lap and I didn’t even have to search and search for a female from Elizabeth. I should have gone out and bought a lottery ticket that day! Next I contacted Michael about supporting this effort and he agreed to have his mtDNA tested. It was an agonizing four months to finally receive the results! The mtDNA Full Sequence test provides data in three regions: HVR1, HVR2, and Coding Region. These results are presented in the form of comparisons to the Reconstructed Sapiens Reference Sequence. An example below shows what the variances might look like in each region. Michael’s Kit Number (395121) and Stephanie’s Kit Number (211040) results show there were no differences in the three regions; that is they both had the same identical variances in each of the three regions. So the probability that they share a Common Ancestor within the 9 generations back to Elizabeth Brownlee is close to 70% and increases as the number of generations increases. So combining the genealogical ancestral trees with this mtDNA test result we can make a very strong claim that Jane Currey is indeed the daughter of Ezekiel Currey and Elizabeth Brownlee and also that Susan Hendrix is the daughter of Thomas Hendrix and Henrietta Wood. The loud noise in the background is me celebrating after solving and dismantling this Brick Wall!! My sincere thanks go to Stephanie and Michael for their gracious support in this effort. You can see Stephanie’s very nice blog at Digging Up Your Family ...one story at a time. Of course, in the back of my mind was always the down side that Ezekiel and Elizabeth were married only six months prior to Jane’s birth. They were married Nov 6, 1759 and Jane was born June 1, 1760. Who knows what the circumstances were in the winter of 1759 in Pennsylvania. Had they made their intentions known in their local community, but the weather was so terrible they couldn’t get to a minister? Was Jane born a little later than she thought she was? There is the possibility Jane was premature, but not THAT premature. Who knows what the record 100 years from now on my own parents will look like with the facts not known. My sister, Virginia, who will be 99 in September, 2016, was born exactly 8 months after my parents were married. A home delivery, of course, and she weighed 3 pounds. The doctor put Virginia aside and said “let’s work on the mother”. My dad’s sister, Aunt Lula, took Virginia, kept her in hot towels, and put her in a shoebox. Obviously, Aunt Lula saved her life. That won’t be showing up in records my descendants will be looking for, so they will likely giggle and think things have always been the same.